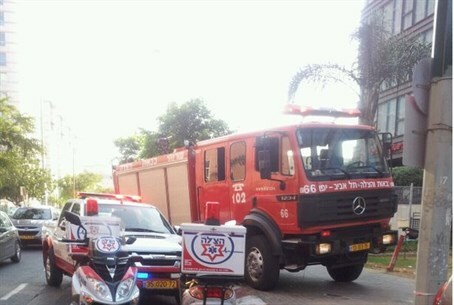 Yeshiva students’ room goes up in flames, but none injured thanks to quick-thinking classmate. An 11th-grade student has been credited with saving dozens of his classmates after his quick thinking led to the evacuation of a classroom before it burned. The student was one of 33 classmates from the Netivot Yosef yeshiva in Mitzpeh Yericho who were spending the Sabbath in Maaleh Michmash. On Friday night, the students slept together in one large room that had been set aside for their use. In the middle of the night, student Dolev Yadai woke up and noticed an unusual smell in the room, and saw sparks coming from the heating unit. Before he realized what was happening, he saw a burning piece of material land on a classmate’s blanket. Yadai realized that he and his fellow students had just seconds to get out of the room before it would fill with smoke and flames. He quickly began waking those around him, who joined him in waking the rest of their classmates, yelling to them to leave the room immediately. Once outside the room, the alert students immediately counted heads to make sure nobody had been left behind. They then woke staff, who called for firefighters. Firefighting crews managed to extinguish the blaze, but not before it had destroyed the entire room in which the boys had been sleeping. Many of the students lost personal effects, including tefillin (phylacteries). The students were released from studies until Monday. In 2011, yeshiva student Oded Hamdi was killed in a fire after saving his friends. Hamdi, 19, rescued multiple classmates from a burning caravan, but was trapped by the flames. His friends returned and dragged him from the structure, but he later died in hospital.